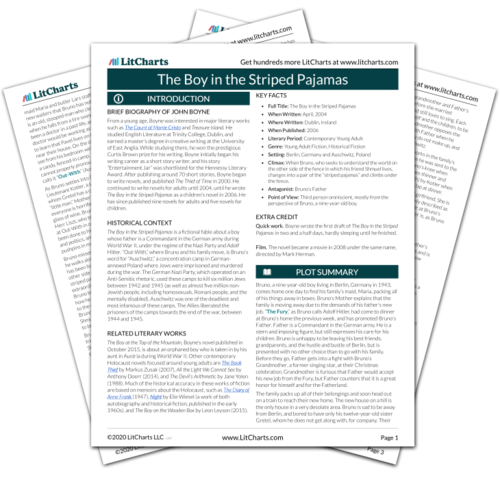 Get the entire Striped Pajamas LitChart as a printable PDF. Matthias, Bruno’s grandfather and Father’s father, is ten years Grandmother’s senior. He supports and is proud of Father’s role in the Nazi party, and opposes how Grandmother lashes out against Father’s new role as Commandant. Maria is the family’s maid. Though she is secretly unhappy with Father’s role at Auschwitz, she believes he is a good man because he helped Maria’s mother when she was sick, and he took Maria in when her mother died. Bruno and Gretel’s tutor, hired to teach them while they are living at Auschwitz. He is a supporter of the Nazi party, and teaches them geography and history in line with the party’s goals and ideals. Munk, Olivia. "The Boy in the Striped Pajamas Characters." LitCharts. LitCharts LLC, 20 Jan 2016. Web. 24 Apr 2019. Munk, Olivia. "The Boy in the Striped Pajamas Characters." LitCharts LLC, January 20, 2016. 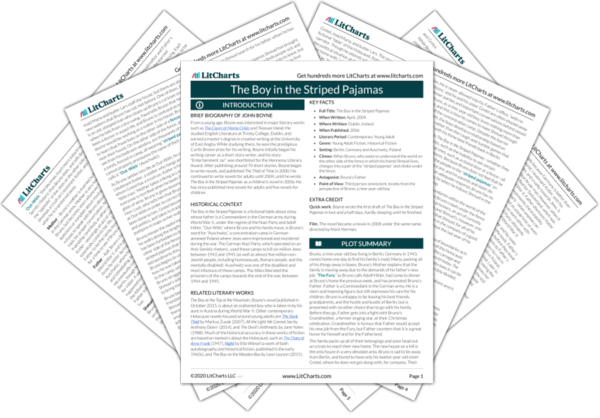 Retrieved April 24, 2019. https://www.litcharts.com/lit/the-boy-in-the-striped-pajamas/characters.